The photo of David Pelc (alias Peltz) from this collection has been added to the Give them a Face portrait collection (KD_00017) and the commemoration wall at the Kazerne Dossin museum. David Pelc (also Peltz) was born on 22 February 1920 in Lodz, Poland, as the son of Abram Pelc (born on 2 February 1884 in Czenstochau, Poland) and Ruchla Horowicz (born in 1890 in Grójec, Poland). His parents had married in Lodz in 1915 and started a family there. David had two older sisters and a younger brother, all born in Lodz: Fajga on 22 November 1915, Cyrla on 22 March 1918 and Mojsek on 5 November 1926. In January 1930 father Abram Pelc migrated from Lodz to Brussels, Belgium, where he settled at 11 Rue Van Helmont. On 19 May 1930 Ruchla and their four children joined him in the Belgian capital. Abram provided for his family working as a tailor and a peddler selling cigarettes. On 24 January 1933, mother Ruchla Horowicz passed away. David was only 12 years old. While Abram struggled to provide for his children, oldest daughter Fajga took care of her siblings. However, the Pelc family remained very poor and depended on welfare organisations to get by. When Abram in 1934 could no longer take care of all his children, youngest son Mojsek was temporarily placed in a children’s colony at the Belgian seaside while youngest daughter was also relocated by the Belgian authorities. By 1935, oldest daughter Fajga had also left the family home to get married. David stayed behind with his father at the family home at Rue Van Helmont and found a job as a tailor-apprentice. In 1936 both Mojsek and Cyrla were allowed to return home and the family is reunited. Before the war, David Pelc met and befriended the non-Jewish Belgian Aimée Cuypers alias Sonia Anoutchin (born on 21 February 1921) who lived at Rue du Laekenveld 78 in Molenbeek-Saint-Jean, Brussels. Their friendship continued even after Nazi-Germany invaded Belgium on 10 May 1940 and David’s life became more and more restrained by the growing number of anti-Jewish decrees. In May or June 1942, David was claimed by the German Arbeitsamt and deported to Northern France where he was put to work as a forced labourer for Organisation Todt, doing construction work on the Atlantic wall. In October 1942, his name was added to the deportation list of Transport XVII, which left Northern France on 31 October 1942. David was able to escape from the train and returned to Brussels. Meanwhile, Sonia started looking for hiding places for persecuted Jews. She tried to keep David safe after his escape, and was also in contact with his cousin Jacques alias Jackie Peltz who lived in the same building as David and his family. On 23 June 1943 David and his cousin Jacques were interned at the Dossin barracks. The circumstances of their arrest remain unknown. Jacques was released from the Dossin barracks on 29 June 1943 because of his Belgian nationality which he obtained when turning 16. David’s name, however, was added to the deportation list of Transport XXI. He sent his friend Sonia several forms requesting parcels. The short lists also contain hidden messages: e.g. “St. Martin” is David’s encoded request to bring his false papers to the Dossin barracks. These documents probably never reached him. 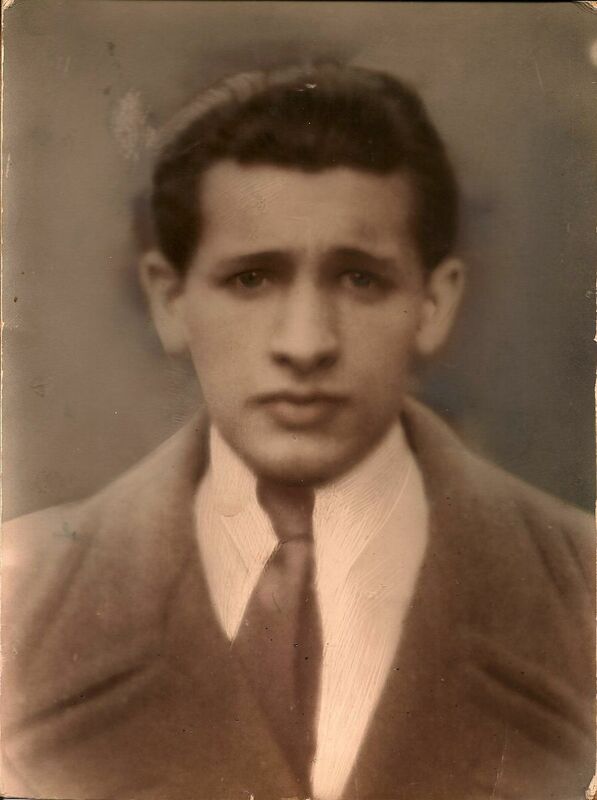 David Pelc was deported on 31 July 1943 to Auschwitz-Birkenau. He did not survive. Jacques alias Jackie Peltz was arrested during Aktion Iltis, the raid on Jews who hold Belgian nationality, on 3 and 4 September 1943. He did not survive deportation from the Dossin barracks to Auschwitz-Birkenau via Transport XXII B (Belgians) on 20 September 1943. His wife Sura Sabine Pelc was released from the Dossin barracks and survived the war. David’s father, little brother Mojsek and oldest sister Fajga probably survived the war abroad, while Cyrla was deported from the Dossin barracks and was repatriated to Belgium in 1945. Sonia Anoutchin survived the war. She married Ted Hailstone shortly after and emigrated as a war bride to Madoc in Ontario, Canada. Sonia cherished her memories of David Pelc until her death in 2018. David Pelc (also Peltz) himself entrusted his photo and yellow stars to Sonia Hailstone. She kept these as well as the documents sent by David during his detainment at the Dossin barracks her whole life. When she migrated, she hid the yellow stars in a clay pot in her basement, but she showed the documents to her granddaughter Sara Hailstone and hung David’s framed photo in her studio. After Sonia's passing in 2018, Sara became the keeper of these items. In 2019 she entrusted scans of the collection to Kazerne Dossin.